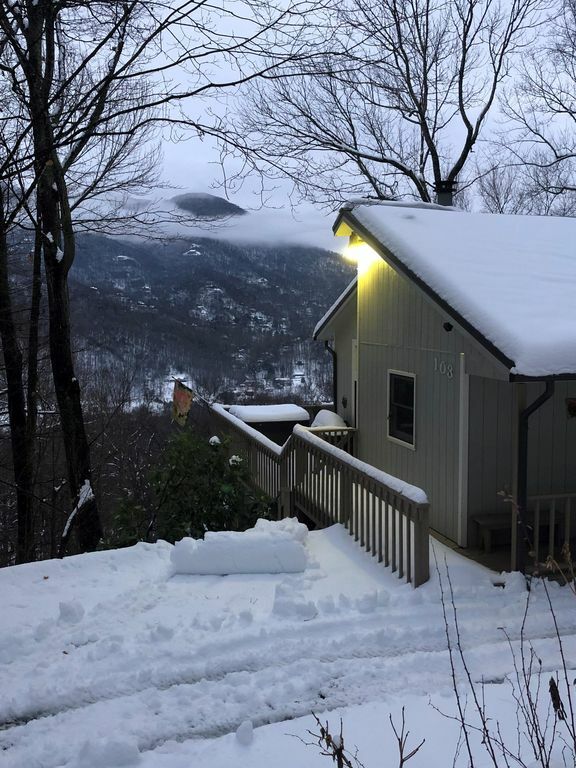 This VERY CLEAN and beautiful home with Central Heat and Air in the Mountains of Maggie Valley, North Carolina is 35 minutes west of Asheville. This private setting is in an area with nearby streams and hiking trails and is easily accessible with paved roads. You will enjoy fabulous mountain views from the greatroom and master bedroom, as well as when you are relaxing in the hot tub, barbecuing, and dining on the deck or sipping a cold drink while watching the colorful hummingbirds and songbirds. You will be located only minutes away from many popular attractions such as the Biltmore House and Gardens, Cherokee Indian Reservation and Harrah’s Casino, Blue Ridge Parkway, numerous championship golf courses, horseback riding, exciting whitewater rafting, snowskiing on Cataloochee Mountain, Great Smoky Mountain National Park and Railroad, gem mining, as well as delightful craft and antique shopping and dining in Asheville, Maggie Valley, Waynesville, and Dillsboro. Viewing the elk in Cataloochee Valley is also a wonderful treat. You will appreciate all the amenities of this Non-Smoking home such as a central heat and air conditioning, wood floors through out, woodburning fireplace, refrigerator, electric oven/stove, microwave and full size washer and dryer. The fully equipped kitchen also includes granite countertops and everything you would need for a gourmet dinner. Besides relaxing in the step-down greatroom, which has lots of floor to ceiling windows to enjoy the wonderful view, you may want to enjoy the cable TV (42"), VCR/DVD, CD player or wireless internet access for all your electronic devices. The master bedroom includes a new queen size iCOMFORT™ mattress. It also features a 42' flat screen TV and private deck with chairs to enjoy your morning coffee while reading the newspaper or watching the songbirds. The second bedroom includes a queen size bed, 42" TV and also has a private bath. Pets are welcome with a non-refundable pet fee. In order to prevent separation anxiety-induced damage from your usually well-behaved pets, we ask that you either take your pets with you or crate them when you are not going to be with them. Please don't hesitate to call me with any questions as I would be happy to talk to you and answer any questions. With all our repeat guest our cabin tends to book up months in advance, however I would be delighted to answer your questions about the area and make other cabin recommendations. Keywords: Clean Private Mountain Cabin with Air Condition and wonderful mountain view and hot tub paved access A/C. I loved vacationing with friends and family in the mountains and have visited many different mountain towns, but fell in love with Maggie Valley again, after visiting many times as a child. I searched long and hard for a perfect cabin and here it is, Bella Vista which means 'Beautiful View' in Italian. I am sure that you will enjoy this cabin as much have I have! I purchased this cabin in 1999 and have met so many wonderful guest over the years who remain cherished friends. Simply stated: THE CLEANLINESS, VIEW and EASY PAVED ACCESS. I could talk about the wonderful benefits of Bella Vista, however, I think my guest reviews say it all. I have so many guest who return year after year. Please take a moment to read the reviews and see what my guest are saying about Bella Vista. Each bedroom has an adjoining private bathroom. Beautiful view overlooking the mountains. North facing. Landline telephone and good wireless service by ATT and Verizon. Floor to ceiling windows to enjoy the view from inside. Granite countertops and all the accessories to cook a large meal. 42" flat screens in all rooms. Tulips, daffodils, roses, daylillies, dogwoods, rhododendron all surrounded by beautiful trees. Maggie Valley Country Club located directly across the mountain. Easy Paved Access, Minutes from the main road of Maggie Valley, Central Heat and Air Conditioning, Wood Floors, Telephone with Answering Machine, Private Master Deck with Rocking Chairs, Outdoor Dining Area, Three Televisions (Living Room, Master Bedroom and Guest Bedroom), Ceiling Fans, Cathedral Ceiling, Garbage Disposal, Coffee Machine, Crock Pot, Blender, Rice Cooker, Waffle Maker, Cooking Utensils, Quality Linens, Playing Cards & Games, Large and Small Charcoal Grill(BBQ), Large Gas BBQ Grill, Iron & Ironing Board, Two Hair Dryers, Everything you will need!, ADDITIONAL HOUSING, Within walking distance of Parker's Nest #4203117. Far enough from each other for comfort, close enough for fun! Loved our Spring Break in the mountains! Bella Vista was a fantastic homebase for our mountain adventures. Bella Vista is very nice and I would highly recommend it! This was our second visit to Bella Vista and once again everything was great! We love the cabin, the location, and the view. Lisa is so nice and you can tell that she wants everything to be just right for her guests. We definitely want to return! Great view, fully stocked, clean cabin! We had a great stay and will definitely return! We had a great time staying here, it's really cute, plenty of firewood, the hot tub was hot and it's super close to cataloochee ski, which is why we chose it. the home was clean and neat and quite cozy. The view is amazing and pictures do not do it justice. I can honestly say this is the happiest we have been with any vacation rental. the owner kept in touch and was very pleasant. There were instructions posted to explain things and that was very helpful...Thank you for sharing your property with us. SO MUCH TO DO, Numerous Golf Courses, Trout Fishing, Bluegrass Shows, 30 minutes to Cherokee Indian Reservation & Harrah's Casino, Whitewater Rafting, Clogging & Mountain dancing at Stomping Grounds, Downhill Skiing & Tubing at Cataloochee Ski Resort and Tony's Tube World, Great Smoky Mountain Railroad, Santa Land, River tubing, Gem mining, 10 minutes to Blue Ridge Parkway, 25 minutes to Smoky Mountain National Park, 35 minutes to Biltmore Estate, Sliding Rock/Waterfalls in Pisgah National Forest, 20 minutes to see the Elk herd in the Cataloochee Valley.